'Fortnite' Is Getting 'Spacier' with Meteorites, Comets and Now a Rocket Launch! A leaked image of what's to come with the Fortnite rocket. 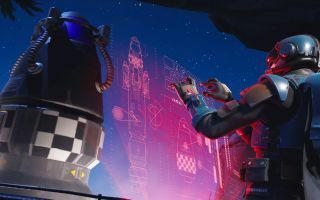 Following a major comet impact in the online multiplayer game "Fortnite," players are now anticipating a major rocket launch as the game continues to incorporate more and more space themes. Fortnite is a free survival game in which players drop onto an island and have to fight to be the last one standing. It's a vibrant, cartoonish battle that's as frantic as it is addicting. The game progresses in periods of time known as "seasons," and players are surprised by exciting new additions with each season. Players are at it again, crafting elaborate theories as rumors swirl about a predicted rocket launch this week. When Season 4 rolled out, players noticed that the map included an unbreakable hatch in the woods in addition to a massive rocket with a mysterious countdown. But "Fortnite" data-miners @TwoEpicBuddies leaked map changes for the game's v4.5 patch — an update to the game — on Twitter, which showed even more significant changes to the map. In this leaked image, it was clear that the rocket was missing from the overhead map, among other changes. Players have taken this to mean that the rocket launch is getting close, with some suggesting that the game's villain, known as "The Visitor," lifted off in the rocket. Other players suggested that it's in midair, waiting to crash, like the comet impact of Season 3. Rumors and speculation continue to fly about the game, which is incorporating more and more space elements. The update was originally expected to drop yesterday morning (June 26), but is now expected to hit today (June 27), as reported by Forbes, though it's reasonable to think that this target date might change again. Following this update, players will anxiously await the fifth season. It's anyone's guess whether players will be able to launch the big rocket themselves from The Visitor's lair as anticipation builds for v4.5 and Season 5. But whatever happens, it seems clear that Fortnite is continuing to include a variety of space items and themes. Aside from the fallen meteorites, the impact comet and the anticipated rocket launch, players can purchase a Space Shuttle Glider and an astronaut skin.